It is easy enough to substantiate the claim that Blake and the Taoist thinker Chuang-tzu were brethren in spirit. The first stanza of Auguries of Innocence contains a lyrical summary of the teachings of the early Taoist thinkers. Waley speculates over the possibility that Blake may have been influenced by the work Tao Te Ching (The Book on Tao and its Power), the classic of Chinese Taoism. He points out that a translation of that work into Latin had been acquired by the Royal Society in 1788 and noted in Philosophical Transactions. Blake may well have seen the work and gained some knowledge of its content. Whether he did so or not, we do know that he shared the Taoist thinkers’ distrust of rational intellect as a means for true understanding. Chance may have guided Hsü Chih-mo to Blake in the late 1920s. He is known to have translated at least one of Blake’s poems—his best known, “The Tyger.” Unfortunately I have not succeeded in tracing his translation. A search through the various indices and bibliographies which register translations of foreign literature into Chinese yields very meagre results as far as Blake is concerned. Prior to 1957 only a handful of Blake’s poems had made their way into Chinese anthologies of English poetry in translation. In 1957 interest in Blake flared up in China. This was not due to mere chance: the World Peace Congress had elected William Blake the poet of that year. A great many translations and analyses of Blake’s writings were published in 1957. In the late summer of 1957 the Chinese Writers’ Union organized a Blake evening in Peking, to which I was invited. Old Bob Winter, an American scholar who during several decades has lectured on English and American literature at Peking University, gave an introductory lecture on Blake and his work, and Guo begin page 25 | ↑ back to top Moruo, President of the Academia Sinica and nestor among Chinese poets, extemporized poetry, hailing the memory of the English poet. The poet Feng Zhi, formerly Chairman of the Department of Foreign Literature at Peking University and presently Director of the Institute of Foreign Literature at the newly established Academy of Social Sciences, has provided me with the following list of translations of and studies on Blake’s writings. Yuan Kejia’s[e] Blake Anthology, which comprises 176 pages, contains a large selection from Blake’s lyrical poetry. The work is divided into the following five parts: (1) Poetical Sketches (Shide sumiao), which contains all the poems of that collection, with the exception of “Fair Elenor,” “Gwin, King of Norway,” “An Imitation of Spenser,” “King Edward the Third,” “Prologue to King John,” “A War Song to Englishmen,” and the prose-poems. 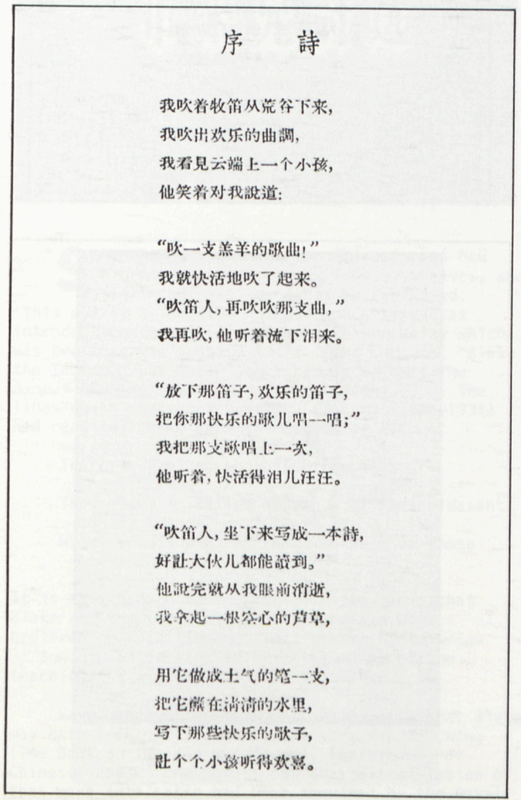 The translations have been done by Cha Liangzheng, who has published poetry under the pseudonym Mu Dan. [e] (2) Songs of Innocence (Tianzhen zhi ge). translated in entirety by Yuan Kejia. (3) Songs of Experience (Jingyan zhi ge), containing all the poems of that collection with the exception of “The Human Abstract,” translated by Song Xueting. (4) Poems from the Notebook 1800-1803, and poems from the Pickering manuscript, translated by Huang Yushi, Song Xueting, and Cha Liangzheng. (5) Fragments, epigrams and parts of Proverbs of Hell, translated by Huang Yushi. 2 Title page. 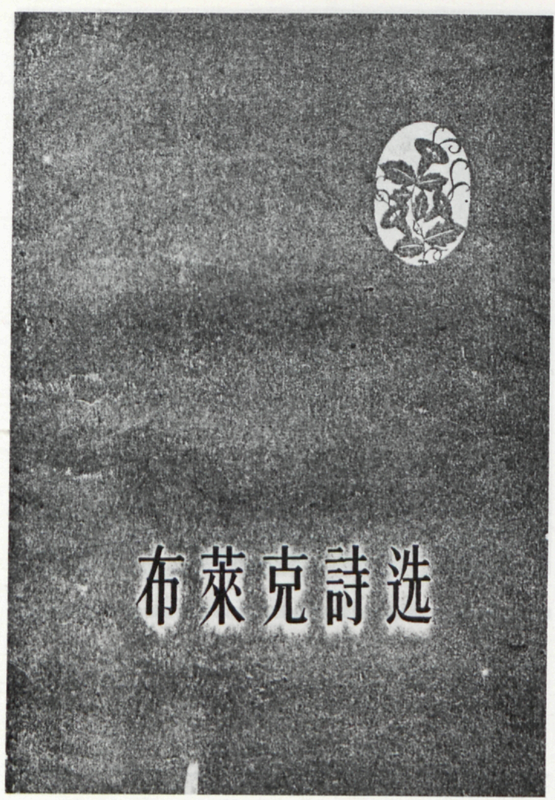 Pu lai k’e shih hsüan (Selected Poems of Blake), Renmin wenxue chubanshe (People’s Literature Publishing House), 1957, Peking. 3 Frontispiece, Selected Poems of Blake. In his book The Chinese Literary Scene (Penguin 1977, pp. 222-32) Professor Hsu Kai-yu gives a biographical sketch of Yuan Kejia, who was born in 1921. As a young student Yuan Kejia took a great interest in modernistic poetry and was particularly infatuated with the works of T. S. Eliot. At the end of the 1940s he lectured in English Literature at Peking University, while at the same time editing the literary pages of the celebrated Tientsin paper Da Gong Bao, which earlier had been edited by the author Shen Congwen, and, after him, by the poet Feng Zhi. After the Liberation Yuan Kejia left his teaching post at Peking University and was enrolled in the team which had been given the task of translating Mao Zedong xuanji (Selected Works of Mao Zedong) into English. His talents as a translator secured him a post on the editorial board of Chinese Literature. In 1957 Yuan Kejia was offered a post in Academia Sinica, where he was charged with editing the Blake Anthology. yields to a revolutionary romanticism which places enthusiasm and fantasy in the seats of honour and demands political and social change. According to Yuan Kejia Songs of Innocence expresses a revolutionary humanism which—coupled with Blake’s Christian idealism—embodies both the positive (progressive) and negative (reactionary) aspects of Blake’s writings. Blake’s fundamentally humanitarian views make it possible for him to attack the inhuman conditions in society. But as a result of the failure of the French Revolution, Blake’s humanism loses its revolutionary characteristics. The truce between England and France in 1802 inspired Blake with the mistaken notions that violence cannot lead to peace and that a tyrannical authority is capable of bettering itself on its own initiative. Thereafter, says Yuan Kejia, Blake preached a message of conciliation which makes him appear a defeatist. Finally Yuan Kejia suggests that Blake’s enthusiastic support for the bourgeois revolution, his social criticism, and his demands for the emancipation of the individual make him a pioneer among the English revolutionary-romantic writers. begin page 27 | ↑ back to top intellectuals down to the countryside, in order to be cleansed through participation in physical labour. In 1959 he returned to his post at the Academy, where he was charged with the compilation of a volume of translations of the poetry of Robert Burns, whom the World Peace Congress had chosen as the year’s writer for 1959. In his preface to that volume Yuan Kejia hands out both praise and blame: Burns’ sympathy with the poor and his hatred against landowners and aristocrats cannot altogether compensate for his lack of class spirit and his reactionary view that man should be content with his lot in life and grab what little is offered while life lasts. Apart from Yuan Kejia’s short preface, the Blake Anthology contains no critique of Blake’s writings. Yuan Kejia does not seem to have pruned the selection in order to accommodate the Chinese readers. Using Blake’s “London” as point of departure Dai Liuling discusses the evil social conditions in London of the late eighteenth century. The author suggests that the deep significance of Blake’s “London” “only recently” has been noticed by certain progressive critics. (Reading Dai Liuling’s paper I was reminded of the film version of Dickens’s Great Expectations which was shown in Peking in 1957 and which many Chinese no doubt believed to be an authentic description of England in the 1950s.) Discussing the widespread prostitution in eighteenth century England, Dai Liuling states that poverty and hunger—these evil products of the capitalist society—were not solely responsible for the spread of prostitution. The brunt of the blame must be borne by the hypocritical sexual morality of the Establishment and the intolerant Church. It is not altogether inconceivable that Dai Liuling’s indignation was directed at closer quarters than the worldly authorities and the Church in eighteenth century England. 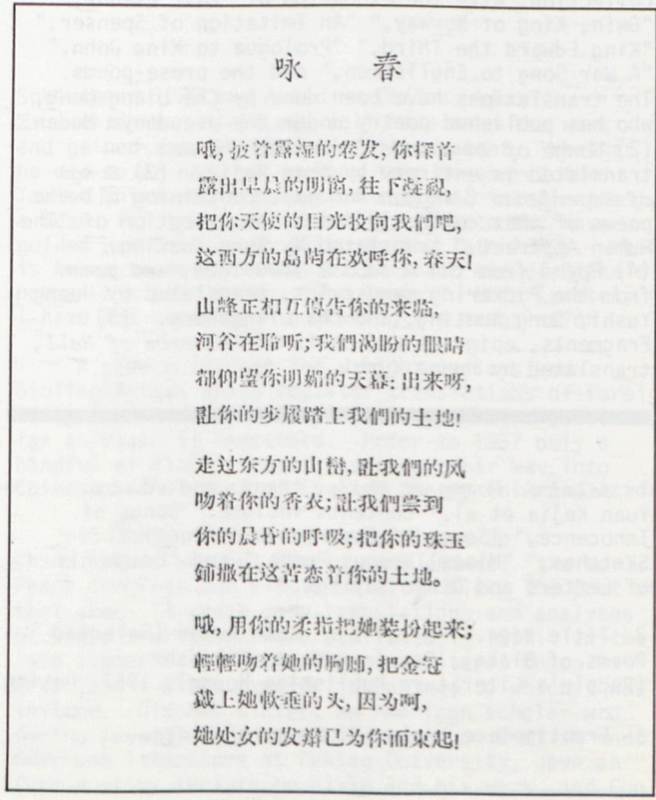 Song Xueting’s “Bulaike de shixuan” (Selections of Blake’s poetry), which appeared in the journal Yiwen (Literature in translation), 9/57, contains a few poems from Poetical Sketches (“To Spring,” “To the Evening Star,” “How sweet I roam’d,” and “Mad Song”); three poems from Songs of Innocence (“Introduction,” “Spring,” “Night”); a few poems from Songs of Experience (“Introduction,” “The Tyger,” “Holy Thursday,” “London,” and “The Chimney Sweeper”), together with some poems from the Notebook and short excerpts from The Song of Los (Plate 6: Asia) and Milton. 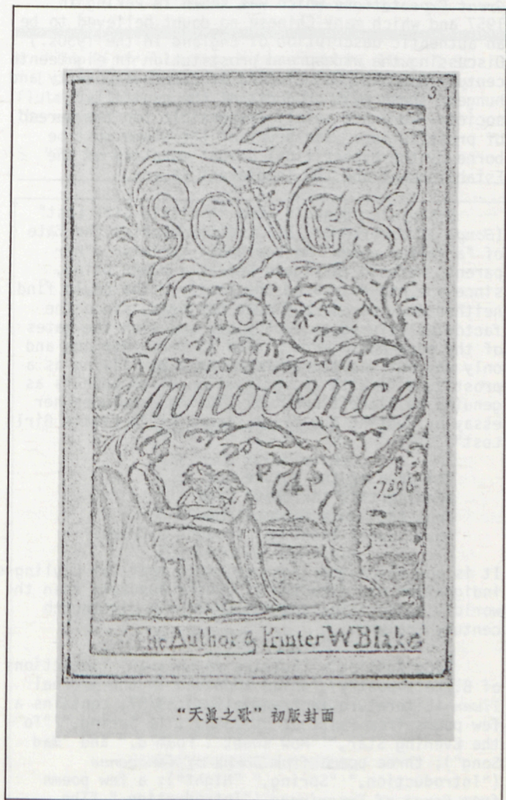 Song Xueting divides Blake’s writings into two main categories. To the first category belong Poetical Sketches, Songs of Innocence, and Songs of Experience, which are said to contain “glittering jewels and sharp dagger edges.” In the second category Song Xueting groups The French Revolution, America, and Vision of the Daughters of Albion, which sing of the Revolution and the emancipation of women; The Four Zoas, Jerusalem, and Milton, which are said to contain Blake’s own mythological system which is difficult to fathom. Song Xueting finally mentions The Marriage of Heaven and Hell, which he considers the best prose writing of Blake. Song Xueting states that Blake was well ahead of his time and that he therefore failed to gain the appreciation of his contemporaries. After his death bourgeois critics rendered the understanding of his works difficult, by obscuring the significance of the symbolism in his social criticism. 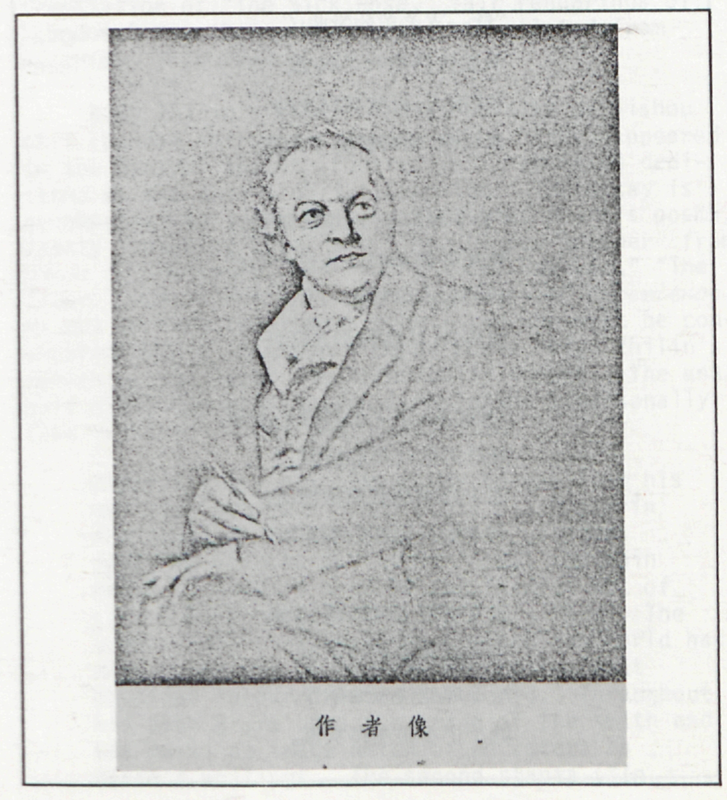 “When we now celebrate the 200th anniversary of Blake’s birth,” says Song Xueting, “our main duty is to weed out all these misleading notions and restore the fundamental significance of Blake’s writings.” Zhao Lourui’s essay “Neng shen ai yi neng shen hen de Weilian Bulaike” (William Blake who was capable of great love and of great hatred) was published in the Wenhuibao 6/57, which appeared on 12 May 1957, a few weeks before the Anti-rightist Campaign was initiated. The author characterizes Blake as “the most kind-hearted, the purest and the most sincere humanitarian,” a man who refused to compromise and who never hesitated to follow the road which he himself considered the right one. Zhao Luorui presents a very fine translation of “The Sick Rose,” fair renderings of “London,” together with passages translated from Auguries of Innocence. Blake’s Tyger has altogether sprung from his own imagination. Blake wrote his Tyger in the same way as our traditional painters depicted dragons and tigers. But the main theme in Blake’s poem is the fearful act of creation which gave the tiger its form. The traditional view that God created the world has here given way to the new conception that physical labour created the world. Throughout his poem Blake uses the image of the smith and his work, an image which often recurs in Blake’s writings. The second stanza (“In begin page 28 | ↑ back to top what distant deeps or skies / burnt the fire of thine eyes?”) makes us today think of the prospecting teams which, struggling to build up a socialist China, search out the natural resources that lie hidden under thousand mountains and ten thousand rivers. The final verses of the fourth stanza (“What the anvil? What dread grasp / dare its deadly terror clasp?”) remind us of the taming of nuclear power which will bestow great blessings on mankind. The poem teaches us that creation is struggle, in which contrarieties are finally united. In the penultimate stanza of the poem (“When the stars threw down their spears / and water’d Heaven with their tears”) the poet creates another synthesis of oppositions, and the martial song changes into a mild melody. The struggle is over and the worker, who has laboured with his task, sees the result and smiles contentedly. The mild lamb and the ferocious tiger, innocence and experience, have been united and that synthesis harbours a new innocence. Bian Zhilin’s interpretation of the lines “When the stars threw down their spears / and water’d Heaven with their tears” is interesting, as it shows that the poet here pushes the ideologist to the side. Bian Zhilin has a ready answer to the question why Blake, in spite of his progressive views, failed to influence the masses of his time. It is commonly known, says Bian Zhilin, that the reactionary English Establishment with all means suppressed opinions which were inimical to its own interests. As a result thinkers and writers had to express themselves in allegorical terms, which in turn led to misinterpretations of their works. We must also remember, says Bian Zhilin, that Blake lacked experience of political struggle and that he therefore sometimes tended to empty speculation. Blake was ahead of his time and was therefore not appreciated by his contemporaries. . Posterity lacks knowledge of the concrete historical background of his writings. This is another reason why Blake has been misinterpreted as a mystic. Bian Zhilin’s close friend Hsü Chih-mo (Xu Zhimo) needed only to read a few lines of Blake’s writings to comprehend that Blake was a Taoist. 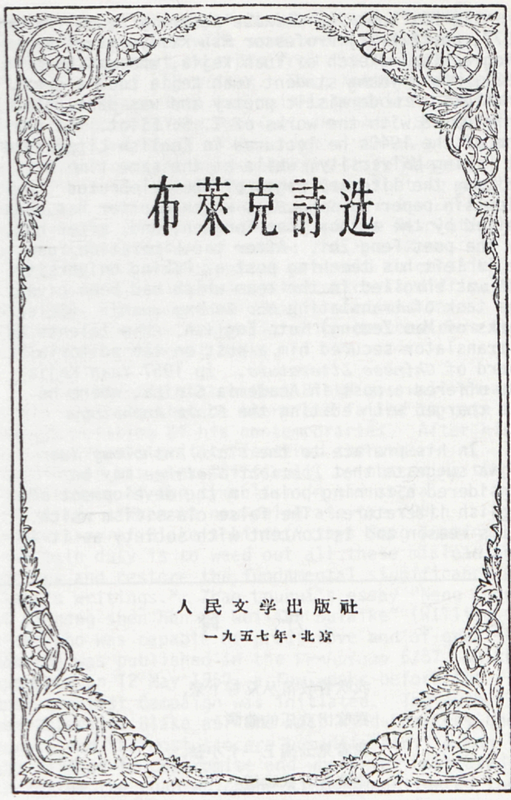 Bian Zhilin, who apparently had devoted a close study to Blake and his English and American interpreters, found it necessary, in 1957, to explain away the mystic elements in Blake’s writings, with reference to misinterpretations which were occasioned by the reactionary English Establishment’s suppression of dissidents. Obviously there was no room for Taoist ideas in the political and literary climate of China in 1957. 6 From Songs of Innocence. Illustrations and captions were kindly provided by Professor Kai yu hsu, Dept. of World and Comparative Literature, San Francisco State Univ. and author of Literary Scene (Vintage).